Portland School Board Chairwoman Anna Trevorrow speaks at the podium, as School Superintendent Xavier Botana, seated right, listens. 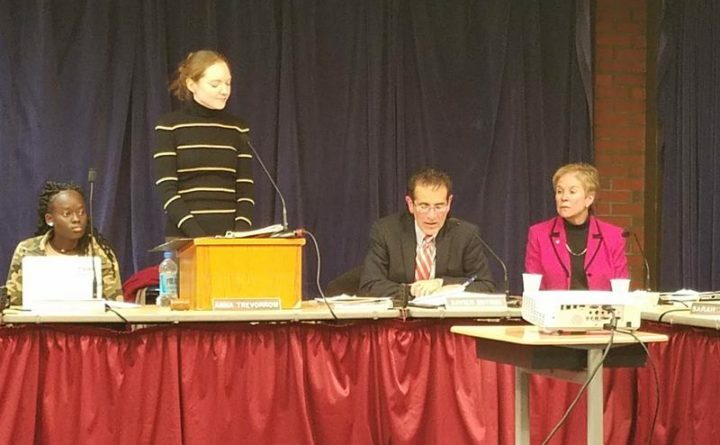 After an emotional discussion about inclusion and equity for all students, the Portland School Board voted unanimously Tuesday night to adopt a comprehensive new policy that affirms and protects transgender and gender-expansive students in Portland schools. Gender expansive is a term used to describe people whose gender expression and identity goes beyond what is perceived as expected gender norms. Gia Drew of Equality Maine was part of a large group of school board members. students, teachers, parents, advocates and attorneys who worked on the policy over the past seven months. Among other things the policy allows students to use restrooms and changing rooms consistent with their gender identity, allows them to use the pronouns they prefer, calls for gender-neutral student dress codes and requires annual training around gender issues for teachers and staff. The policy is consistent with Maine law that requires non-discrimination in schools. School Superintendent Xavier Botana said as someone raised in a traditional Latino family he couldn’t have imagined supporting the policy 20 years ago but has re-examined his misconceptions. Now, he says, he’s proud of it, and so are most of the people he’s heard from. The policy was drafted by a group of school board members, parents, teachers, students and advocates over the past seven months. Follow BDN Portland on Facebook for the latest news from Portland.